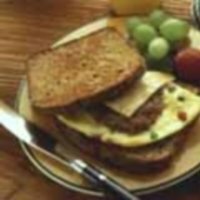 This delicious breakfast bagel recipe puts some fun flavors together to wake you up in the morning. With some juicy nectarines and some spicy flavors, this is no ordinary bagel. So have some fun with breakfast and ditch the same old bagel. Give this recipe a try to spice up your day. 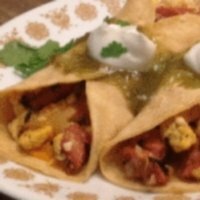 Below are the list of ingredients, directions, recipe nutrition information and Weight Watchers points. Add more than just cream cheese to your morning bagel. This recipe adds a bit of spice with red chili pepper. Plus some juicy nectarines and basil leaves will liven up this breakfast meal. Toast bagels and spread with cream cheese (1-1/2 tablespoons per bagel half). 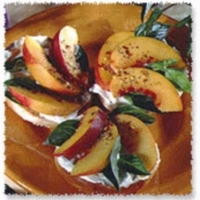 Top with basil leaves and nectarine slices. Sprinkle with pepper and/or chili flakes. Nutrition facts shown below are per serving. The number of serving is noted in the header section below. The serving size is the first item noted on the nutrition facts table. Note: The Weight Watchers points values do not include the nutrition for the nectarines. In addition to this breakfast idea try this waffle club sandwich. Here's another fruit and bagel recipe you can have as a fun snack. This breakfast recipe will start you on a healthy day as it's made with healthier options. 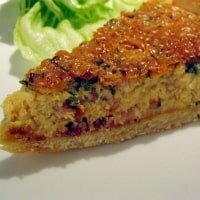 If you are looking for a fancier hot breakfast, then check out this Quiche Lorraine recipe. This recipe is filled with eggs, potatoes & veggies & topped off with green chili sauce and melted cheese. 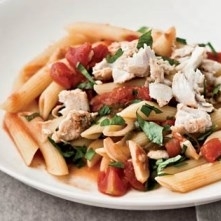 Fish never tasted so good as this pasta stir fry recipe made with swordfish. 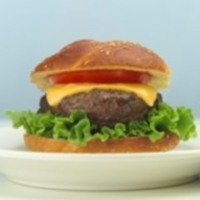 If you are in the mood for some grillin, then try out this simple burger recipe. 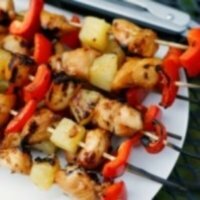 Here's a tasty grilled appetizer that will go great with your cookout tonight. Use this free online weight loss tool to figure out your BMR calories required. The Basal Metabolic Rate is the amount of calories you burn while at total rest. Download this spreadsheet to track your food points, activity points, daily and weekly allowance. This spreadsheet works with both the points plus and the original method. Use this custom search to find new recipes from some of the top recipe sites.